If you are yet to aware of Opera News App, you are probably living in a cave because it's all over the internet. Opera News is currently the most downloaded app in Nigeria and among the top 10 across the African continent. Opera News is an amazing app! Not only give fresh and undiluted information but also given free airtime to the users via referrals and app downloads (only for users in Nigeria and Kenya). Due to the fraudulent activities discovered in their referral program from people who are dubiously getting referral bonuses from illegal methods, Opera Administrator decided to "temporarily suspend" the sharing and withdrawal functions on the platform and the rewards that have already been earned also retained. But promised to resume back once everything is fixed. Good news guys, the issue was fixed and you can now use your rewards that have already been earned to purchase airtime and the platform has reopened for you to make more money! 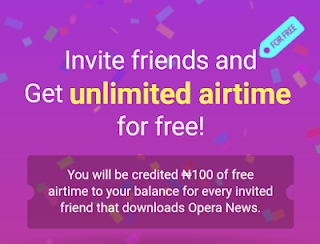 If you are part of the people who have airtime to withdraw from the Opera News balance, rush in now to withdraw your earnings. Simply follow the instruction below to Redeem Your Bonus. Opera will notify you about the introduction of "points" and asked you to proceed to convert your points to real money. Click OK, to update the app to the latest version, after that, a login page will appear, then login in. Your total money will show to you and a "redeem button" will display as well. Now to earn even more money, open the app, navigate to "earnings dashboard" and tap on "invite friends" and share it with your friends on Facebook, Email, Telegram, WhatsApp or any other place of your choice. The more people download with the link you shared on social media or elsewhere, the more money you make.